HCM City (VNA)- Construction on the first rapid bus line of HCM City is scheduled to begin in January 2017 with total investment of over 137million USD. According to officials, of the amount, 124 million USD will be funded by the World Bank's International Development Association (IDA). The rest will be from the city government's budget. 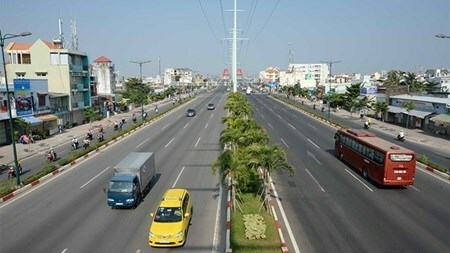 Jen Jungeun Oh, of the World Bank, who spoke during a recent seminar on environmentally-friendly transportation, said the bank would invest in the BRT for use on Mai Chi Tho and Vo Van Kiet boulevards, which run through districts Binh Tan, Binh Chanh, 1, 2, 5, and 6. Linking the An Lac area in the city's southwestern region and the Rach Chiec area in the northeast, the bus line will be about 23 kilometres long with 28 bus stations. The city is now considering a list of contractors and designers. Upon completion at the end of 2018, the system will be able to transport up to 28,300 passengers per day. Luong Minh Phuc, Director of the Urban Traffic Works Investment Management Board, said that 28 BRT buses run by compressed natural gas would be used. He added that BRT would be faster than normal buses thanks to its priority lane and priority at red lights. The system's ticketing and operation is expected to be similar to the metro system now under construction.